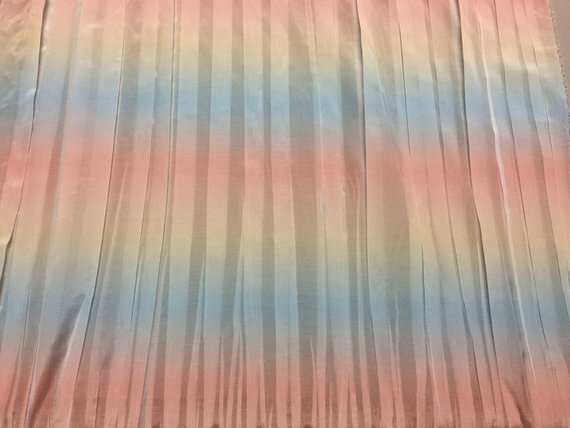 Shirting weight Cotton, a Blue, Pink and Yellow “Rainbow pattern” all printed on White. Quite the unusual piece, is it pleated and then finished with another stretchy finished pleat on the end of the fabric. 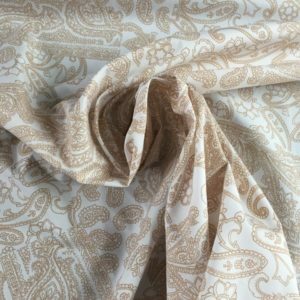 It could be used for all types of clothing but namely a top, shirt, blouse, skirt or dress. Made of Cotton, with a touch of Polyester its hard to wrinkle, semi sheer, light to medium weight around 4 ounces. Use it as you would any shirting, crepe, broadcloth, cotton lawn or voile. Made in France, 36″ wide.